"Fiddle" is a generic term for any chordophone played with a bow. Colloquially, "fiddle" is frequently taken for a member of the violin family as well as for the "Kit" or "Pochette". Fiddle in our time is usually taken for the violin when played as a folk instrument. We use the term fiddle for the medieval string instrument that was know during the Middle Ages and early Renaissance as ffythele, ffidil, fiele and fithele and today is usually known as the medieval fiddle, the predecessor of the violin and a key instrument played by the minstrels. The fiddle was the most respected instrument of the Middle Ages and, along with the harp, the most common. It was described as being able to play all types of music from the highest art music to popluar dance music. The inspiration for our mediaeval fiddle came from the famous painting by Hans Memling (1435-1494) now in the Reliquary of St Ursula in the Hopital St Jean in Brugges. 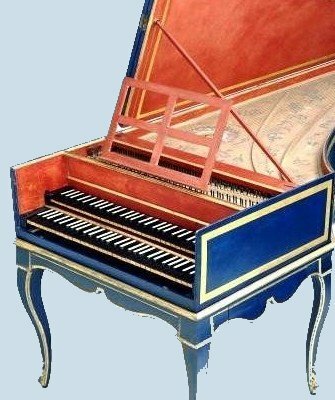 The instrument is depicted with a very flat fretted neck and a shallow bridge. A low string tension would therefore apply which together with the almost viola sized body gives the fiddle its characteristic timbre. The Renaissance Workshop Company Ltd. offer a choice of two bridge shapes to suit different playing styles. The first is slightly curved allowing the strings to be bowed in chordal fashion with only the top string available for the melody line (the top two strings were often tuned in unison and bowed together). Set up like this the instrument responds well to tunings of G d g d? d? or G d a e? e? The alternative bridge is slightly higher with more curvature to allow individual bowing of all strings and would suit a tuning of D G d g d? or c G d a e? Each instrument is entirely hand built by 'in-house' experienced craftsmen to special order in our own workshops in Toledo (Spain) to the highest standard of craftsmanship. They come with 12 months warranty and 12 months free access to our 'helpline' for advice on setting up, playing and maintenance. A soft padded bag or fitted hard case and a choice of bows are available as optional extras if required. 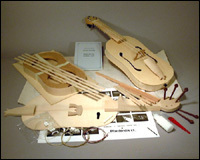 The same fiddle is offered in kit form for home assembly. The price includes the license to build one instrument for private use and 12 months free access to our 'helpline' for advice on construction, setting up, playing and maintenance. A manual with clear and concise step-by-step full assembly instructions. A set of photographs illustrating further each stage. An important feature of our fiddle kits is the inclusion of a mould to ensure success, even for the first time builder, so assembly of the body can begin immediately. The neck is cut ready for final shaping and the peg holes are reamed to eliminate the need for any special tools. Traditional materials are used throughout including a maple back, a Swiss pine front and top quality gut strings & fretting. You can make the same Fiddle from scratch, following detailed step-by-step instructions through the construction process in a clear and concise manner. A fully dimensioned life-size drawing with templates and a set of photographs illustrate each stage. This icon indicates that you can choose between the hard copy of the documents sent by postal mail, or the downloadable electronic files, in pdf format to your computer. In order to view and print the pdf files, you need the free 'Acrobat Reader' program installed in your computer. Life-size drawings require large printers. Electronic documents have a reduced price, don't have shipping costs, but are non-refundable. Not all of the items listed on our site are available immediately. Products without a reference nor a price are rarely available for quick dispatch. If you are interested in them, please contact us. All published prices are exclusive of VAT and shipping costs. They are shown in RWC. For security and service quality, we need your order to be in writing and cannot take it by phone. If you want to buy, please, fill and send the ORDER FORM. Should you have any difficulty, please contact us.